After a long bus ride from the Bandipur tiger reserve, we finally arrived in Bengaluru, which is located in the southern state of Karnataka. While we were in Bengaluru, we spent a few days at Visthar, an organization that focuses on sustainable development and social justice. 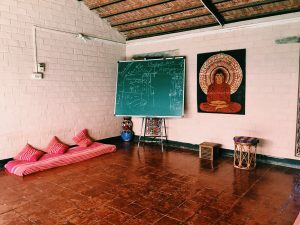 For me, our stay at Visthar has been the most reflective part of the trip, allowing me to understand the deeper meaning behind all the material that I’ve learned this semester. Throughout this semester, some of the learning material has focused on the ecology of India. However, Visthar added the human element to this scientific knowledge, combining environmental concepts with social equity. A major topic that was continuously discussed was viewing nature and humanity as one. Instead of having a dualistic mindset, many lecturers preached a harmonious relationship between nature and humans, ridding the common hierarchical viewpoint that humans are above nature. Another recurring theme was the importance of being mindful towards your neighbor. When using the term “neighbor,” this does not just refer to the person living next to you but also those living thousands of miles away from you. Your neighbor encompasses the entire Earth, all of nature. From my stay at Visthar, one of the most intriguing topics mentioned was environmental justice. Environmental injustice cases occur because most people disregard the ethics of the neighbor. The administrative office building at Visthar in Bengaluru, India. Photo by Hannah Metwally. Visthar provided us with an interactive learning experience; the staff educated us in multiple forms. In educating us on the Bhopal incident, there was a discussion panel featuring scholars from both India and America. In the discussion panel, Dr. Johnson, a professor from Gustavus Adolphus College, gave a presentation on environmental justice. Environmental justice is the fair distribution of environmental risks to all social groups. Environmental justice activists believe that no group of people should bear a disproportionate amount of environmental consequences. Dr. David Selvaraj, the founder of Visthar, also composed a short play about the Bhopal tragedy, an environmental injustice case study. As the play was about to begin, I could hear intense coughing and shrieking from behind me. Startled by the noise, the play immediately caught my attention, stirring up emotions from within me. The actors in the play demonstrated the immense sufferings that the residents of Bhopal had to endure. David also ensured that the play presented an exchange of different stories and attitudes toward the situation. Before coming to Visthar, I had never heard of the Bhopal incident, so the play was a good introduction to the horrors of this tragedy. In 1984, one of the most horrendous industrial leakages in history occurred in Bhopal, the capital of the Indian state of Madhya Pradesh. The corporation responsible for this incident was the Union Carbide Corporation, an American company that dealt with the manufacturing of different chemical products. During the 1970s, the Indian government was pushing for an increase of foreign companies to be built in the country in hopes of aiding local investors. Encouraged by the Indian government, the Union Carbide Corporation built a pesticide plant in a shanty part of Bhopal with mostly marginalized people living nearby. Similarly to what happens in other parts of the globe, the plant was built in the poorer section of the area because these people lack the ability and resources to resist this decision. 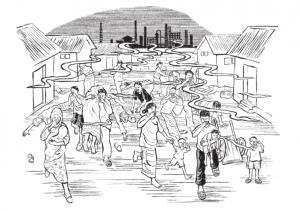 Chemical factories and landfills are typically stationed in low-income communities because planners are aware that there will not be much contestation from the nearby inhabitants. Because the market for Sevin, the popular Asian pesticide that the corporation was producing, had significantly shrunk, the plant was planning to be shut down and sold to a new buyer. However, during this waiting period, the pesticide plant kept running in a dangerous and hazardous manner, failing to follow basic safety procedures. All of this was occurring under the knowledge of the local government in Bhopal. Then there was a malfunction in one of the operators, spewing a toxic gas known as methyl isocyanate into the midnight air. The gas smothered the region of Bhopal, choking nearly 10,000 people to death in just a matter of days. After 24 hours had passed since the toxic gas was released from the pesticide plant, it was reported that around 90,000 people had swarmed inside the nearby medical facilities. The deaths of those who died shortly after the incident were only the beginning of the many more casualties that would emerge from the exposure to this toxic gas. Hopelessly running from the gas that filled the streets and seeped inside homes, survivors of the incident have described the unimaginable pain that they experienced “as if chili powder was in the air.” The toxic gas, methyl isocyanate, has irritant properties, which aligns with what many Bhopal residents expressed feeling at the hospitals. Foamy mouths and burning sensations in the eyes, lungs and skin were all common agonies that the residents had to face. After examining the autopsies of those who had died in the tragedy, scientists found that the lungs were the most affected organ, weighing three times the average weight. An illustration of a survivor and her description of the pain that she felt during the incident. Because those that were most affected by the Bhopal tragedy were of lower financial status, the residents had no way of escaping this highly contaminated region. Bhopal was their home. The industrial leakage was never fully cleaned up as the Union Carbide Corporation refused to admit the injustices that they had committed toward the Bhopalis. The chemicals had not only entered the atmosphere, polluting the air that everyone breathes in, but had also permeated into the soil and groundwater. Unable to flee, the Bhopal residents had constant exposure to harmful chemicals. Whether the chemicals were ingested, inhaled and/or absorbed through the skin, the effects of this exposure produced outlasting health consequences for the residents. The heavy weight of Bhopal was even felt by those who were not present at the time of the leakage, which includes the newborns of the victims. The chemicals disrupted the normal functioning of the victims’ reproductive systems, resulting in 20,000 premature deaths. If the child did survive, s(he) would mostly likely have to live life with limp limbs or other birth defects and suffer from developmental delays. To this day, the Union Carbide Corporation has failed to take moral responsibility for the industrial disaster that it has inflicted on the people of Bhopal. The corporation has displayed an oblivious attitude toward the whole situation, attempting to place the blame on someone else. The corporation’s main argument was that since the Indian government funded 22% of the corporation, the blame should not solely rest with Union Carbide. While there may not be one culprit to blame, the focus needs to be shifted from trying to pin down the offender to actually helping those living in Bhopal. Those who lost loved ones in the tragedy will never have enough compensation to recover from this heartache. However, little has been done to improve the lives of the survivors and future generations. The outcome of the lawsuit battle was that the corporation paid 470 million dollars to the Indian government. Other than this small payment, Union Carbide has done little to help those affected; the corporation did not even clean the mess that they left behind. The Bhopal tragedy demonstrates the typical pattern that occurs in all environmental injustice cases. People with power and wealth, who are usually the ones generating the most pollution, dump the environmental consequences onto the most vulnerable groups in society. Those responsible for the Bhopal incident were able to leave the city unharmed while others had their last days on Earth. The Bhopal tragedy is just one of the many environmental injustice cases in India. Out of 133 countries, India ranks #1 in social issues that have emerged from the building of industrial plants, sites for extraction of natural resources and landfills. 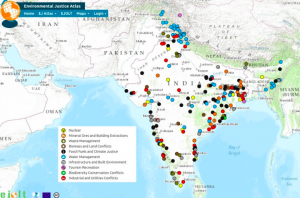 According to the Environmental Justice Atlas, which provides a map of all 2,282 environmental injustice cases reported in the world, only about 18% of these cases have produced favorable outcomes for the victims. In the next couple of days, we plan to travel Delhi. Delhi is known for having the worst air quality in the world with 600,000 pollution-induced deaths annually. Many people in the group have been worried about being able to handle the pollution levels in the city, debating on whether or not to buy a face mask. But, what about the people in Delhi who spend all day outside without any type of protection? People of higher economic status have the luxury of protecting themselves to some degree from the polluted air. Some people spend most of their time inside either in a building or a car. However, instead of driving to work, others walk. Instead of sleeping inside a home with air conditioning, others spend their nights outside. The distribution of the effects of Delhi’s air pollution is skewed as those from affluent backgrounds, who usually contribute the most to this poor air quality, are the least harmed. 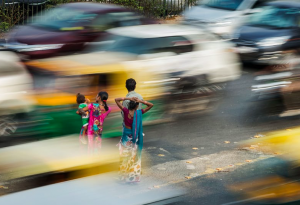 The effects of Delhi’s air pollution is unequally distributed among its population. Photo by Roberto Schmidt. The idea of “everyone for themselves” is the main cause for the destruction of the Earth and the inequities in society. But, without the resources that the Earth provides, nobody can survive. No amount of money can safeguard those from the disasters that will stem from environmental destruction. Therefore, care for your neighbor because the downfall of your neighbor will eventually lead to the downfall of yourself. Johnson, Cindy. (2017). Ecojustice. Lecture, Kristu Jayanti College, 14 November 2017.